Remove the hair on back ,chest,legs and arms. Remove the hair on bikini underarms lips and etc. Alexandrite 755nm is the most extensive choice for hair types and colors. 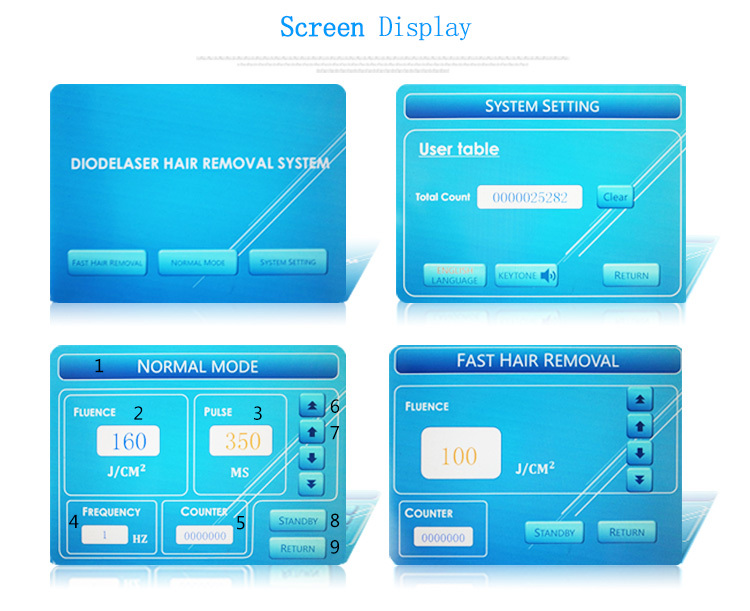 755nm laser is shown greater energy by melanin absorption, making it suitable for clear and fine hair or weakened color. Especially for hair embedded in eyebrows and upper lip, It has good penetration. 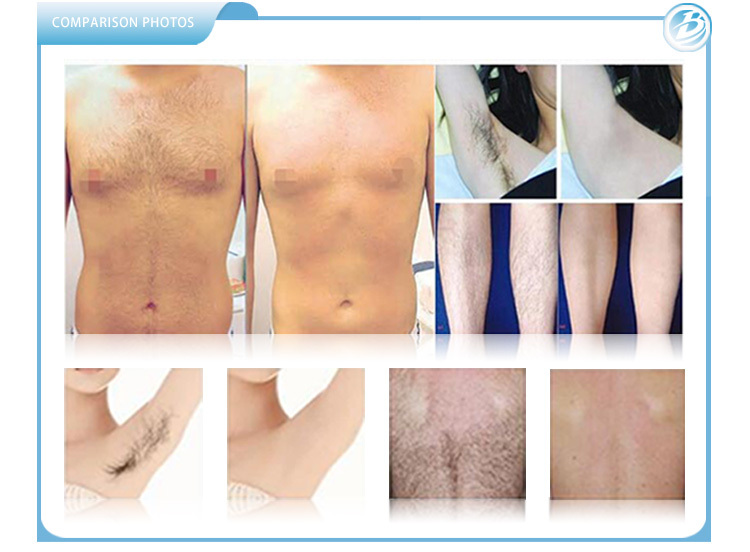 This 808nm diode laser hair removal machine adopts selective thermodynamic principle, enabling energy to penetrate the top layer of skin and absorbed by the melanin in hair follicles whose temperature rises to as high as 60℃ in a flash. As a result, the papilla is damaged and the hair growth cells are killed, which leads to the falling off of original hair. Nd YAG 1064nm is suitable for dark skin, offering the highest penetration, reaching bulbous, papilla and also handling hair that is deeply embedded in the scalp, arms and pubic areas. 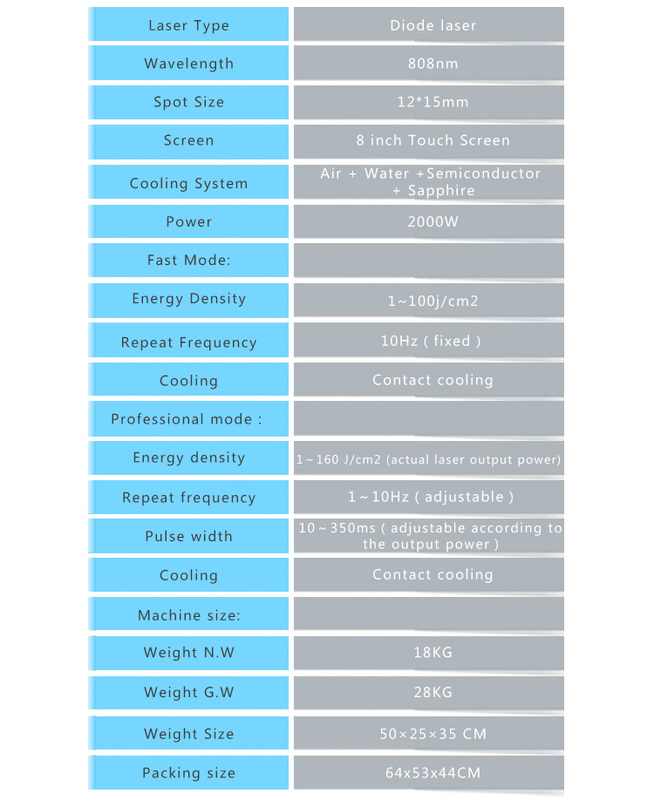 Cooling: Patented sapphire cooling device lowers the epidermis temperature to -10℃～0℃, which protects patients from pain and skin damage. Adjustable: Remarkable design allows operators to adjust pulse width according to skin colors and treatment areas. Optimal: 808nm light is optimal for hair removal for its least absorption by water and protein, yet most by melanin. Fast: Large square spot accelerates the treatment speed, not only enhancing efficiency but also eliminating the overlapping defect of traditional circle spot.